The Child wants to have a yard sale. I have no idea why this should be, as I’ve done nothing – ever – to encourage her or instill the idea that a yard sale would be fun. I have sold stuff at exactly one yard sale since she was born, and she was not yet three and so doesn’t remember spending an entire day trying to stave off boredom by sorting change. I took her to a yard sale once, and bought her a Lite-Brite set for a dollar; we got home and discovered it didn’t have enough pegs left to be of any use. I ended up buying a pound of pegs on eBay for an amount of money that wasn’t unreasonable, but did make the Lite-Brite somewhat less of a screaming deal. I suspect that there are people who go from yard sale to yard sale collecting pegs from Lite-Brite sets and selling them online to people like me, who arrive at the very same yard sales an hour later and don’t think to check the box before buying the peg-free Lite-Brite unit. I’m fine with the Lite-Brite subeconomy – seriously, kudos to whoever thought that one up – I just don’t want to be a part of it. Nor do I want to sit outside on a rare sunny Seattle day waiting for people to come by and haggle with me over prices that are laughably low to begin with. But, The Child reminded me, this was all her job. It was going to be her yard sale. Her sale, her stuff, her money. And so I relented, and when school let out, the first Saturday that the weather seemed like it might cooperate and one of The Child’s friends was around to help out, I stuck a yard sale sign out on the street as two girls finished putting price tags on the remnants of their toys and early readers. Little kid stuff, they said, as I surveyed the dolls and stuffed animals and Disney VHS tapes. People stopped by and it quickly became clear that my help was not needed – first, because they’d done enough preparation and had all the change and math skills they needed; but second because people didn’t really seem to be buying very much. A neighbor boy stopped by and bought a stuffed animal. Another neighbor came by and asked if the girls would try to sell a couple of pictures for him; they agreed, and when the pictures failed to sell, they each chose their favorite one and he made a gift of them. Mostly though, they sat around and played Minecraft and waited for customers. They didn’t complain, but I learned later, the customers did: The prices were too high. Much too high. One lady yelled at me because I asked to much money for that red hat, The Child told me later. I sold it to her for her price, she told me. I can’t decide if I am disappointed or pleased with her lack of haggling ability, and simply note that this personality trait is clearly nurture, not nature – being half Jewish and half Dutch, The Child should surely have quite the talent for bargaining. I wonder if this is one of those recessive traits, and whether someone has done a study on this. I notice the large box of stuffed animals has disappeared, and she tells me proudly that some ladies from the Humane Society came by looking for stuffed animal donations, and were thrilled to take the entire box. Did you get a donation receipt? I ask. How do you know they were from the Humane Society? I ask. Because they said they were, she tells me. I decide I don’t really care where the stuffed animals went as long as it isn’t back in my garage. The Child ended up with about $30 for all her efforts, which was clearly not as much as she’d been hoping for, but she seemed satisfied: She did it by herself, and had money to show for it. My only contribution to the day, other than hanging the yard sale signs, was to make some cookies for the girls to sell, to possibly make some extra cash. 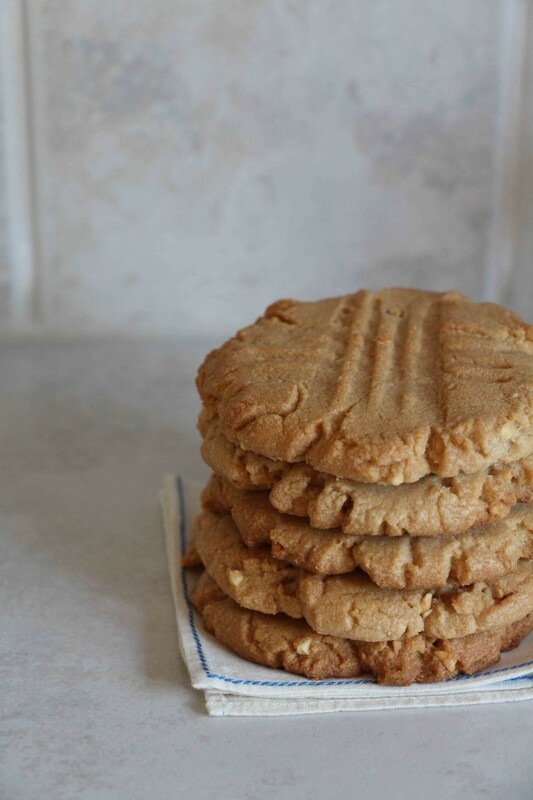 At least, that was my excuse: the truth of the matter is that I saw this recipe for Peanut Butter Cookies in Joanne Chang’s Flour cookbook, and all I could think was, I haven’t had a peanut butter cookie in years. I asked The Child what she thought about the idea and she said, I’ve never had a peanut butter cookie. How is that possible? I asked nobody in particular. Everyone is allergic to peanuts, she said. It was a valid point: I’d stopped keeping peanut butter in the house, since I couldn’t use it in her lunches – it was banned from her elementary school. She’s not allergic to peanuts, but because everyone else is, she’d never tasted a peanut butter cookie. The cookies from Flour are everything a peanut butter cookie should be: giant and soft, but not overly so, with a bit of crunch for texture. They’d be perfect dipped in milk, if you happen to like to dip cookies in milk. I loved Chang’s technique of using a 1/4-cup scoop to measure out the cookies, which were perfectly large. The cookies didn’t really sell well, like everything else that day, but we liked them, and in spite of the lack of customers, they were gone in no time. In a stand mixer, cream together the butter and sugars on medium speed until light and fluffy, about 5 minutes. Scrape down the sides frequently while mixing.Beat in the eggs and vanilla until thoroughly combined. Add peanut butter and beat on low about two minutes, or until thoroughly combined. In a medium bowl, stir together the flour, baking soda, and salt. Add the flour mixture to the butter-sugar mixture, mixing at low speed just until the dry ingredients are incorporated. Scrape the dough into an airtight container and refrigerate at least 3-4 hours, preferably overnight. When ready to bake, heat oven to 350 degrees Fahrenheit. Drop the dough by ¼ cup balls onto a baking sheet, about 2 inches apart. Flatten each ball with your palm, then use a fork to create the traditional criss-cross pattern. Bake 18-20 minutes, or until the cookies are golden brown on the edges, but still slightly soft in the center. Let cool on the baking sheet for a few minutes, then transfer to a wire rack to cool completely. I took these out a bit later than Chang suggested and my cookies were more crispy than chewy. I loved them that way. I love everything about this post. First of all, I grew up in a family that did both sell and buy at garage sales. We’d drive around the city looking for good ones! We lived in a neighborhood that didn’t permit actual garage sales but twice a year the civic club would host a huge sale in the area high school parking lot and everyone would wanted to could rent a space to sell their stuff for a $10 contribution. My mom would do it every time. She’d spend nights before the event (worked full time in the day) pricing and sorting and labeling. Then we’d get up at the crack of dawn on the appointed day, stop by a doughnut shop for sustenance and spend the next two hours setting up shop. The sale opened to the public at 8. Here’s the best part. And you are going to laugh, but once we were finished setting up, we’d take turns to walk around and see what the other neighbors were selling. Technically no one was supposed to start selling before 8 but we made exceptions for fellow vendors. So, while we got rid of some stuff and made some money, we went home with other people’s treasures too. Possibly even a Lite-Brite set or two. And definitely some Lincoln Logs. Secondly, those peanut butter cookies look delicious. The perfect snack on a garage sale day. Or any day. Oh, man. We had a huge neighborhood yard sale every year at the apartment complex where I grew up. I didn’t mind that so much because all the neighbors either came out to sell or buy or at least said hello on their way to the supermarket. But it was so big (six square city blocks) that you were pretty busy all day long. I got tons of books at that every year growing up: Nancy Drew and James Bond for a quarter or less. Somewhere along the way I just lost patience with yard sales, though.